There are many shower pranks you can play on your victims. Consider the following 7. In this prank, the idea is to put an item into the shower-head that will contaminate the water that flows through it. Naturally the water will land on your victim if your victim is taking a bath, causing them to be even dirtier than when they started. Of all the pranks listed here, this is probably the most disgusting. You can use any flavored bouillon cube you want, or you can try putting any solid sugary sweets that don't dissolve too quickly. The flavored bouillon cube will leave your victim smelling like beef or chicken (depending on what you put in) while the sugary sweets will leave them feeling sticky. Works in any shower, so long as the shower head is detachable. Check out the video to see for yourself that it works. Towels come in many colors other than the usual white. 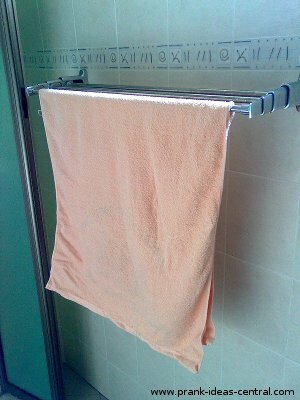 For this shower prank, the more colorful the towel is, the better, but we can still work with whites. The idea is to get powdered food dye and sprinkle it to blend in with the towel. Your victim probably won't notice anything amiss until he or she becomes very colorful indeed. Food dye stains on the skin and clothes will stick for a long time and won't be washed off by just water. Introduce the remedy only after you've had a nice long laugh. The red stain will fade away when repeatedly washed with shaving cream . If you want the colors to be temporary, just use colored chalk and it'll wash right off. This could be one of the scariest shower pranks for your victim, so be prepared if you suspect that your victim may faint at the sight of blood. The prank is played like the bouillon cube prank above, except that you will be using a 'blood cube' that you can purchase from a gag store. Make sure you dry the insides of the shower head carefully, otherwise the cube will start fizzling prematurely. When a warm shower starts, it will start turning red and fizzing. Alternatively, you might like to use red food coloring instead of the blood cube. It comes in 4 forms - liquid, paste, powdered and gel. For our purposes the paste, powdered and gel varieties are more suitable. Note that all these gag items will quickly get washed out so there's a chance of your victim missing the prank. This is a really simple shower prank, but you need a little preparation and access to the bathroom while your victim is taking a shower. The idea is to pour ice-cold water over your victim when he or she is taking a nice warm shower. Make sure you have access to a lot of ice if you don't have ice-cold water. Stirring in ice into water helps speed up its cooling. Get some bloody soap or dirty soap bloody soap (opens new window) or dirty soap (opens new window). When your victim lathers up on these soaps, the bloody one results in red foam that looks like blood while the dirty soap stains your victim's hands black. The bloody soap comes in disappearing and non-disappearing varieties. Plant these in your bathroom or in anywhere the use of soap might be expected. The next person to wash his or her hands will get a surprise. You might be able to prolong the prank if you've really quick hands and you can swap the soap with a regular one when 'proving' to your victim that it's ordinary soap. When your victim is showering, sneak into the bathroom and rub butter on the floor in front of the shower. If you can't get into the shower, rub the butter on the floor in front of the shower, and watch for the slip. Beware, as this prank is as dangerous as any fall on a hard surface can be. When your victim is in the shower, enter the bathroom and steal his or her clothes. Optionally leave a costume of your choice for them to wear, then get your camera ready to take a snap of your poor victim for posterity. This prank works best if the victim is using a shared toilet and will have to walk a distance away to his or her room. If you have a sink with a sprayer, you can tape down the handle to the sprayer and watch your victim get drenched in water from turning the water on!